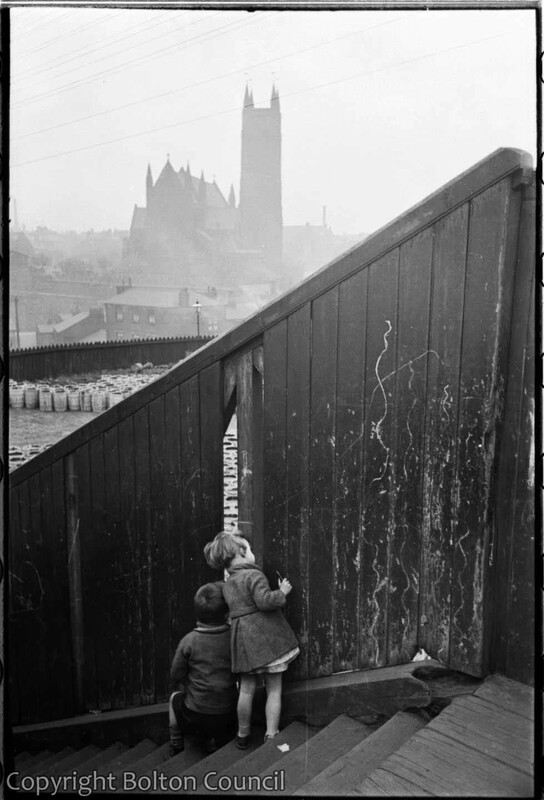 Children peep through a gap in a railway bridge fence. Humphrey Spender took a sequence of photographs of children playing on this railway bridge. There is still a bridge at the same location, and it is still covered in graffiti (2012). Bolton Parish Church is visible in the back of this photograph. The barrels, which are just visible, could be for the tar used during the construction of St Peter’s Way. I think this is my favourite photo. That little lad could have been me ….. twenty odd years later! There was something enthralling about steam engines shunting coal wagons in Craddock Sidings (to the right of this shot) and, the highlight, seeing the ‘double headed’ Colne to London train about 9.10am cross the Croal Viaduct. That coincided with morning assembly in the Junior Hall on the first floor of Th’aulgh Board (Haulgh County Primary)School. Miss Pierepoint was not pleased!! The large building, in the valley bottom, is the Bull and Wharf Hotel. Below the fence (mid picture) was the original Church Wharf Garage, which moved into the Palace Cinema on Radcliffe Road (not Mule Street!) in the late 60’s. Both the building and the business are still there. Now! Those barrels! I wonder …… was that a ‘tongue in cheek’ suggestion? If they did contain tar, it was more likely to be poured between the stone sets in our back street. It was a pain, in summer, when it melted and stuck to shoes, clothing and skin. St Peter’s Way wasn’t even a twinkle in the Planners’ Eyes when this photo was taken. In fact, it was not until the late 1950’s/early 1960’s, when the Farnworth-Kearsley By-pass (Bolton Road, Kearsley to Manchester Road, Great Lever) was being planned that it became a serious proposition. Plans for St Peter’s Way (the eastern limb of the ‘Bolton Inner Relief Road’), from the northern end of that By-pass to Kay Street/St Georges Road, were unveiled about 1964. Thank you for the vivid recollection – and the correction regarding the tar! What a lovely recollection Peter..When i look at photo,s taken before the war its nice to see all the metal fences before they were sadly cut down during hostilities. I was at the Haulgh School in the 50’s when Miss Pierpoint was the headmistress.Hard but fair,got me into grammar school though I came from a single parent family.Lived on Bury New Road.Fell into the gasometer near the school that I was forbidden to go near and dried my clothes in the air raid shelter attached to the school.Iron bridge was forbidden but went on that to.Went to the Cinema on Saturday afternoon.A good old fashioned school.Remember Anne Fish,Denise Halliwell who died,I was Brenda Darlington. Your name doesn’t ring a bell but Ann Fish was my second cousin (I think?) Our Grandmothers were sisters. The Fish’s had a shop on the corner of Bury Old Road and (Back) Mule Street. Whereabouts on Bury New Road did you live? We were “at the bottom” near the junction with Bury Old Road. Do you remember my sister, Joyce Robinson?She was in your class. Her friend was Pat o’ Brown who lived in Mule Street. I have a photo’ of your class Scottish dancing in the top hall .I was in the nursery when Joyce was in the ‘top class’ but I think I remember a lot of you. I remember haulgh school.I became a teacher and wanted to be like Mr Cromarty who made learning fun.Anyone remember him? I remember haulgh school.It was awful except for Mr. Cromarty who made learning fun.I was a teacher for 40 years and tried to be like him in awakening childrens` interest in all sorts of subjects.Do you remember him? Oh yes. And William Glyn Rogers. It wasn’t that bad but it was an old school. My Grandma went there. Didn’t your Dad have the shop, next to the Co-op, on Castle Street? Yes, he did and we lived behind it and in the house next door_(there were four children and a lot of pets) . I remember Glyn Rogers too. A lot of teachers in those days weren’t as qualified as they are today. He would have come into teaching after the war.I remember him hitting me because I proved that a sentence could still make sense if it started with ‘because’ . When I was at college, we were shown pictures of some of the worst schools in the North of England. One of them was Haulgh County Primary. The iron bridge picture brought back memories. I was dared to leave the playground and go on it by Lesley O’Brien and Susan Fish. The aftermath was terrible to behold …at school and at home. Hi everyone, Really enjoyed reading all of the comments and memories here. I attended Haulgh Board School approx 1957 to 1964 my two older sisters went there too. Our surname was May, my eldest sister is Barbara, middle sister Margaret and I’m the ‘baby’ Veronica 🙂 I have vivid memories of the headmistress Miss Pierpoint, Mr Rogers, Mr Cromarty and Mrs Lee. I don’t recall Mr Cromarty being a fun teacher, I found him strict and scary. I remember Fish’s corner shop and Susan Fish was the same year as me. Pat and Lesley O’Brien are cousins of my two cousins: George and Graham O’Brien. Sadly mrs Lee died a good few years ago,I used to play with her son Peter, She Lived on Rannoch rd Breightmet. she was a nice woman. Her sister? miss moorhouse aslo a teacher teached at Crompton fold Head teacher then the horried Mr Robinson. I attended Haulgh Board school in 63/64 for a few years! I smile 55 now but still gave a few memories although I was only 3/4 years old. I lived what was the corner shop next to the Wellington pub on Phithean St and my friend Diane’s parents owned Lamberts newsagents for many years. I moved away around 1966. I was at the Haught CP School in the 50’s, our teacher then was Mr Reece, a lovely small welshman. I was in the same year as Joyce Robinson and Pat O’Brien. I remember Joyce’s butchers shop in Castle street opposite the police station. I think Pat O’Brien went to Bolton Tech after O’Levels and delivered papers for the shop on Bury New Rd. There was a sweat shop opposite the Palace Cinema on the corner of Bury Old Rd and Radcliffe Rd, which sold 1d drinks of Vimto. I have a photo of the school football team of 1956 if anyone would like a copy. Wow I used to mate out with Pat OBrian and her sister. I am Joyce’s youngest sister. She left Haulgh CP when I started school.She went to Hayward Grammer and later became a teacher. (All us Robinson girl’s were teachers…all retired now). I remember Mr.Reece. He brought me from the nursery one day, stood me on a chair and told me to show the big boys and girls how to draw a tree. I remember a few people in your class at school even though I was quite small. Pat o ‘ Brown, Alan Craine,Anne Fish and others.I have a ‘photo of you all doing Scottish dancing in the top hall near the staff room. You all look so little- not at all like you seemed to me at the time when anyone who had reached the grand age of 10 was properly grown up. My name was Margaret Gillard, I started Haulgh Board at the age of 3, in 1953, left 1957. The teacher I remember was Miss/Mrs Lennigan, the skin off here afternoon café used to hang from her lower lip, the coffee always smelt lovely, (not sure now of the spelling of her name), the Head Mistress, a Miss Pierpoint not sure if I’ve just made that name up. The pupils I remember with fondness are, Purthia Drew, Ilona Drew (no relation, well not then anyway). Ilona went on to attend Tonge Fold, as I did, well for 2 years anyway, then I moved south. Purthia I never heard from or about since, which is sad. Trevor Gasgoine was another. I had a giraffe on my blanket, clothes’ peg etc. We had a nap on camp beds in the afternoon. On Friday afternoons we played Simon Says, then the teacher sent two of us, (could have been one but I don’t want to get anyone on the wrong side of the health and safety executive), over to the shop to buy lollipops for all the class. My happiest times at school were at Haulgh Board. Looking at ramblings on social media I’d say the school served us well, no matter what ‘stats’ or ‘non participants’ say. I loved Haulgh Board though only a bubba at the time of course, really. I went to haulgh board school and I am doing some work and research on the school. I remember you. I think one of your sister’s was in my sister’s year.She was called Joan Robinson. I remember all the teachers you mention. Mr. Coronary was strict but he did things like science and history and read interesting stories to us. He lived quite near to us and I used to go to his house with a neighbour’s son to have extra lessons and play with his children. He used to play home movies ( backwards) which we thought very funny. I’ve recently done a painting of the school. It looks very bleak but that’s how I remember it. When I was at college, one of our tutors said that it was possibly the worst school he had come across. I hope you had better memories of it. Hi Jean and Mark, I’m sorry for my delayed response to your messages, but I hadn’t checked on here for a week or two. I went to Haulgh County Primary from 1970 to 1978 Miss Pierpoint was the headmistress but then she retired and Mrs Oakes took over, I remember Mrs Booth, Mrs Nuttall (proper scary teacher) and Miss Crittenden, and Mr Cromwell who had loads of hair and a beard and played a guitar all the time. I remember assemblies in the hall with the giant hymn sheets and being scared of the stairs up to the attic, no one ever went up there!! Loved my time there. Hi I went to Haulgh County Primary from 1956 aged 3, I was in the nursery and remember Mrs Blood who was a nursery teacher. I remember Miss Pierpoint and Mr Rogers. My grandparents and Aunt lived opposite the school gates in Elton Street. I have fond memories of my time at the Haulgh. Both my father and brother also went to the Haulgh. I have a particular interest in this railway bridge. My first memory is sitting on my father’s shoulders, on the bridge, watching Manchester burning. I now know this was (probably) 24th December 1940 when Trafford Park was bombed. I lived at 1 Bury Old Road (with my parents Harold & Louie Johnson) and I remember sleeping under the stairs during air-raids. We also spent one night in the air-raid shelter (mentioned by another respondent), but preferred to shelter at home. From our back window we could see “my railway bridge” and I cried when it was being demolished. The property next to our house (towards town) was a cycle repair shop, then Bratby’s bakery, then, on the corner, an Off-licence. Across the road, in Dorset Street, my grandparents (Isaac & Janet Agnes Johnson) lived at no 6 and my uncle & aunt (Jack & Edna Roberts) at no 4. I attended Ridgeways Endowed School between 1942-48 and remember, particularly, teachers: Miss Wood and Mr Hardman. We moved to Bromwich Street in April 1946. A message for Peter Blundell. Were you a member of the 16th Bolton (St.Chad’s) Scout in the early 1960’s? Hello Brian, or should I say “Kim”. I don’t think I need to say yes, after that. I’ve only just seen your message. For some strange reason I’ve stopped getting email notifications from this site and only check it, occasionally, now. I’m living in London now. Please let me know what you are doing now. Does anybody remember a motorcycle shop on Bury Rd. near the junction of Castle St. It was a Suzuki franchise in the 70s but had been there from the 50s I think. Was run by a proprietor named Tommy Jones. Wondered what happened to him? Good to hear from you. I’m living in London now. Met Edward & Irene Thornton and Ian & Barbara Laycock for a meal in early June. Just reading all these comments now ,so takes me back,I must have been in the nursery 1948 until I moved into the primary school.A bit bullied at the time as I didn’t have a dad around but it toughened me up.I think we were all a lot tougher in those days and aimed to succeed .